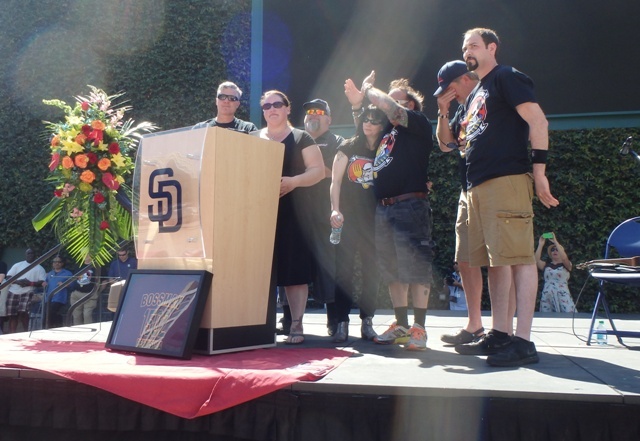 It was a hot Saturday, but hundreds of Mike Hardin well-wishers turned out for his memorial at Petco’s Park in a Park in downtown San Diego. A still of Mike Hardin in younger days. 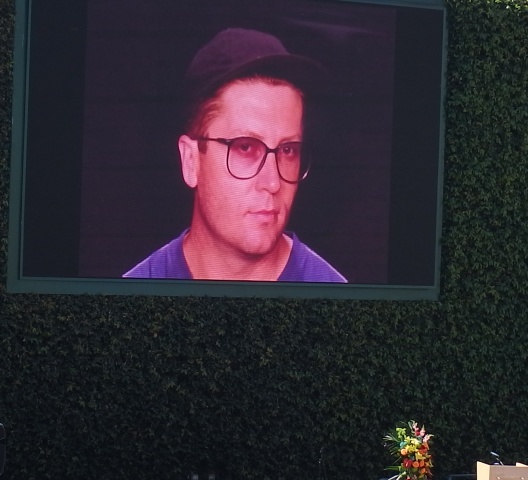 Music was played and videos and stills from Mike “Bossman”‘s life were on the big screen in front of the crowd. 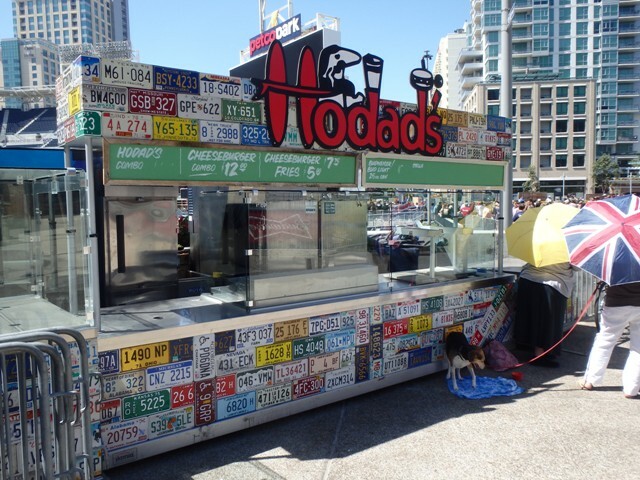 Many OBceans were there but so were many others, people whom Mike had touched over the years with his iconic hamburger joint, Hodad’s – strangers, friends and their families, other chefs. 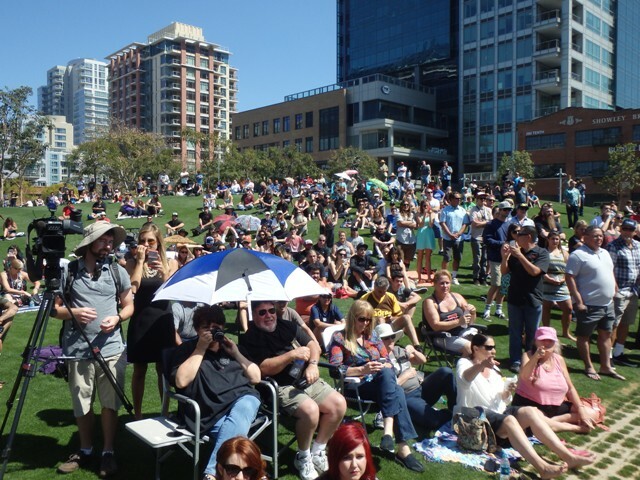 There must have 350 in the chairs and sitting on the grass at the small park next to the Padres baseball stadium. Guy Fieri of Food Network’s Diners, Dives and Drive-ins. 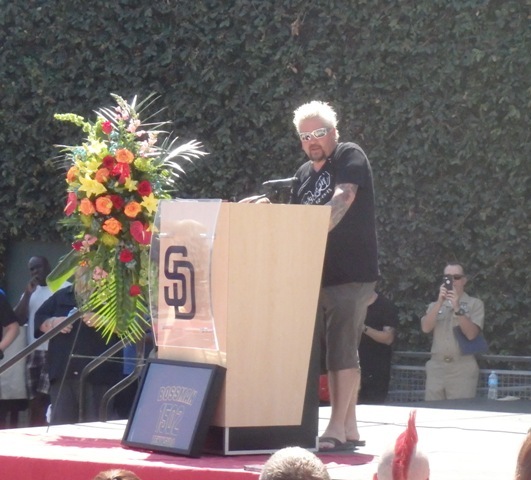 Guy Fieri of Food Network – the man who made Mike famous – and his hamburger one of the nation’s top 5 – was very eloquent in describing probably the most famous OBcean in modern history. The “Messlords” got up in front of the crowd and spoke of their experiences with Hardin feeding sailors on board ships across the seas. 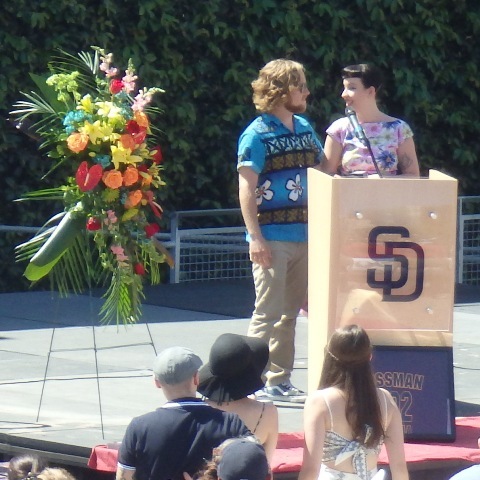 By time Mike’s son Shane and daughter Lexi stood in front of the crowd, there was nary a dry eye on the field. Shane talked about how his dad had taught him that the most important things in life are learned in kindergarten – like be nice to others, share, don’t hit others, clean up your own mess …. And Lexi recounted a cute story Mike had taught her, about a young man – who watching him for awhile – asking the old man on the beach who was bending over and one-by-one tossing washed-up starfish back in the sea. The young man told the old guy that there wasn’t time to help every starfish. The old man, ignoring him, bent down and picked up one more and threw that one into the water. “It helped that one, didn’t it” the old man said. People in the crowd stood and gave these siblings who will be carrying on the business a standing ovation. In all, it was a great outpouring of sympathy for the family and respect for Hardin – who didn’t finish high school, and was told by a highschool counselor that he would never amount to much. 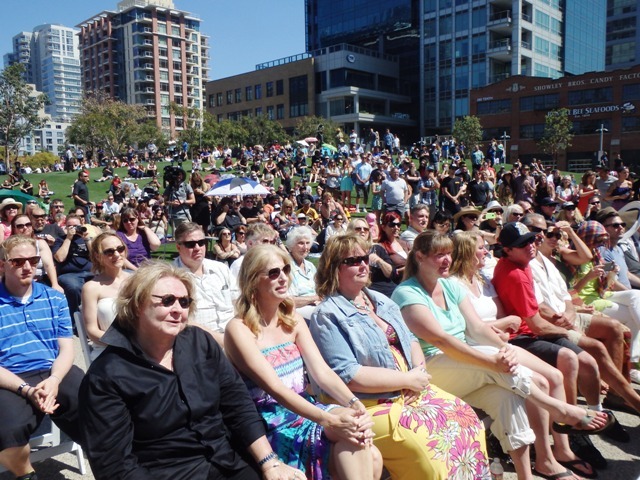 All the Hodad storefronts were closed Saturday, allowing his employees to attend the event.